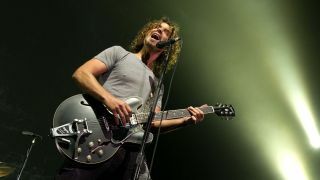 Soundgarden singer's death was "sudden and unexpected"
Soundgarden and Audioslave singer/guitarist Chris Cornell has died at the age of 52, his representative has confirmed. Brian Bumbery told the Associated Press that his death was "sudden and unexpected". The Wayne County medical examiner’s office said Cornell killed himself by hanging. "He was found on the bathroom floor, our medical unit were called and he was pronounced dead on scene," a spokesperson told the BBC. "A family friend went to go check on him and observed him on the bathroom floor." Soundgarden were in the middle of a US tour, and played Detroit's Fox Theatre on the night of Cornell's death. The band were due to play six more dates, including Columbus's Rock On The Range festival on Friday, before resuming work on a new album. We'll bring you more news as soon as we have it, but until then, our thoughts are with Chris's family and friends during this difficult time.